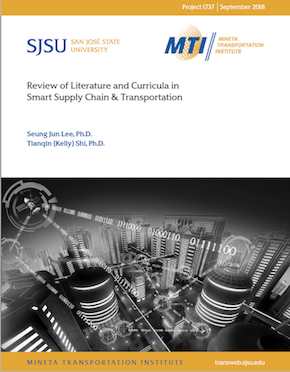 This study provides a review of existing smart supply chain management (SCM) literature and current course offerings in order to identify unexplored implications of smart SCM. Specifically, the study focuses on curricula within the state of California to derive potential opportunities for the relevant practitioners in the Bay Area. In addition, the study further extends curriculum review to other well-recognized SCM programs around the U.S. By exploring current relevant course offerings from different academic institutions for higher education (i.e., universities), this research aims to deliver general ideas useful to knowledge practitioners in fields concerning SCM. Finally, the research illustrates a conceptual framework aimed at fostering familiarity with the necessary research topics for the evolving smart SCM. Dr. Seung Jun Lee is an Assistant Professor at Lucas College and Graduate School of Business, San Jose State University. He holds a Bachelor degree in Mechanical & Aerospace Engineering from Seoul National University, a Master degree in Engineering Management from Duke University, and Ph.D. in Business Administration from Texas A&M University. Dr. Lee’s research interests include topics in healthcare operations, service operations, and management of technology. Dr. Lee’s primary research method is data-driven empirical research. Dr. Tianqin Shi is an Assistant Professor at Lucas College and Graduate School of Business, San Jose State University. She holds a Bachelor degree in Mathematics and a Master degree in Management Science and Engineering from Shanghai Jiao Tong University, and a PhD degree in Business Administration from University of Illinois at Urbana Champaign. Dr. Shi’s research interests include sustainable operations management and service operations, with a major focus on eco-friendly product design and environmental policies.